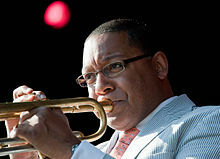 Wynton Marsalis (born 18 October 1961) is an American trumpeter and composer. He is among the most prominent jazz musicians of the modern era, as well as a well known African American instrumentalist in classical music. The reason why the music is important is that it's an art form— an ancient art form— that takes in the mythology of our people. Jon Pareles "Review/Jazz: Wynton Marsalis Takes a Long Look at Slavery," New York Times (4 April 1994):C-13. This page was last edited on 3 June 2018, at 00:20.